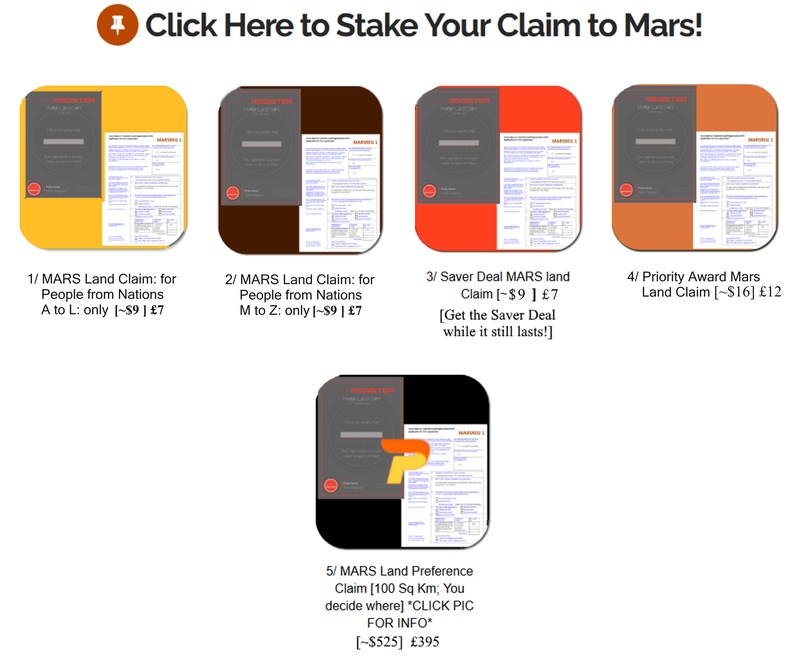 Click for a REAL & LEGAL Mars Land Claim! 1000 X CHEAPER than novelty Mars deeds! A Great GIFT or INVESTMENT?...You decide! THIS IS REAL! … standard price up to 10 acres for 1 cent [US] !! Spring 2019: new SAVER deals available at 40% reduction !!! On average our standard price [per acre] is at least ONE THOUSAND TIMES CHEAPER than those so-called deeds out there! If you get in EARLY you can get a claim at even more reduced prices (“Nationality Claims” are on indroductory offer at just £7 [$9], the same as our Saver Claims… because we want “The Martians” to be as multi-national as possible). Note: “Preference Claims” are allocated against chosen future plots (hence the higher price) and “Priority Claims” will be the first of all the standard claims dealt with by a lottery method. All sales are operated smoothly via the Shopify platform which is very stable to fast high volume transactions. Payment can be made through Shopify payments [credit cards processed: safe, secure and fast] or by Paypal [you dont need to be a Paypal member to use Paypal so you can choose to proceed as a guest and use secure credit card payment. On payment you immediately get a downloadable certificate bundle [also by email]. You will need to give us the name of the claimant for our records [eg yourself or the recipient if it is a gift]. All PDF certificates are stamped. If you have any problems with the payment process, contact us via email [admin@marsregister.net] or via the form on our contact page.